Seeking Health Optimal Electrolyte is a dietary supplement containing key compounds that support optimal training performance and high energy levels – essential electrolytes, creatine in the unique form of Creatine MagnaPower® chelate, taurine, D-ribose, and niacin. The preparation is a healthy alternative to classic sweetened drinks for athletes. The product is available in three delicious flavors and is in the form of a water-soluble powder, enclosed in separate sachets. The package contains 30 sachets. Creatine is naturally found in the human body, primarily in skeletal muscles, where, as phosphocreatine, is an important metabolic energy storage in the form of ATP. Creatine effectively improves muscle endurance and training parameters. It neutralizes the lactic acid produced as a result of anaerobic glycolysis, mitigating muscle soreness and fatigue. It supports anabolic processes, protecting proteins against breakdown, enhancing their synthesis and supporting the building of desired lean body mass. Creatine is particularly helpful during a workout with the predominance of anaerobic conversions. D-ribose is a simple sugar naturally occurring in the human body, classified as vitamin-like compounds. It participates in the protein synthesis and is the part of the nucleic acids present in RNA and DNA. D-ribose affects the increase of key nucleotides, e.g. ATP, ADP, and UDP, due to which it demonstrates the synergism of action with creatine and effectively strengthens its action leading to an acceleration of muscle strength increase. It is believed that D-ribose can increase creatine activity up to 6-fold. Additionally, D-ribose supports to increase aerobic capacity and energy levels, as well as it can also protect against cardiovascular diseases. Niacin, or vitamin B3, performs key metabolic functions in the body. It is a substrate for the synthesis of NAD + coenzymes and the phosphorylated form of NADP +, which participate in many oxidation and reduction reactions. Niacin is needed to maintain optimal metabolism in the mitochondria. Since it has a beneficial effect on lipid metabolism, niacin also has antiatherosclerotic properties. It increases the level of HDL lipoprotein while reducing the content of atherogenic LDL, VLDL, and fatty acids. Niacin is also essential for the proper functioning of the nervous system and has properties that prevent the processes of neurodegeneration caused by, among others, consumption of ethyl alcohol. Electrolytes, the magnesium, sodium, and potassium salts that are soluble in body fluids are responsible for the proper osmotic pressure, participating in the regulation of water and electrolyte metabolism and the liquid levels in the body. They are essential mainly for the proper functioning of the nervous and muscular systems. They affect the optimal glycogen regeneration, proper thermoregulatory processes, and participate in the processes of muscle fiber contraction. Electrolytes are lost with sweat, which also occurs during a workout. However, even if no sweating occurs, an intensive physical effort increases the demand for mineral salts. Their deficiencies leads, among others, to disorders of water metabolism and water retention in the body, muscle cramps and increased heart rate. Taurine is a non-protein amino acid naturally found in the body. It supports the efficient transport of creatine to the muscles, increasing its use by the cells. It has a beneficial effect on post-workout regeneration and participates in maintaining water and electrolyte balance. In addition, taurine plays a role of a neurotransmitter in the central nervous system and can potentially optimize the metabolism of neurons and thus support cognitive functions. 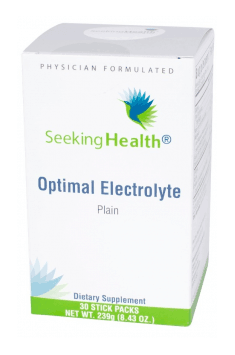 In summary, Seeking Health Optimal Electolyte is a valuable alternative to regular sports drinks. The product is recommended especially for physically active people, shaping their figure, athletes, individuals performing physical work and during intense sweating. Optimal Electrolytes Sticks 30 sach. Add the contents of one stick pack to 8 ounces of purified water. Stir or shake until dissolved. Small, comfortable stick packs to enjoy a healthy electrolyte drink in any situation – at the gym, during physical work or active leisure. In contrast to regular sugared drinks, the product is sweetened with stevia, meaning low energy value and low glycemic index. Berry flavor: malic acid, citric acid, natural aroma, Stevia leaf extract, grape extract powder (coloring). Orange flavor: citric acid, malic acid, natural aroma, stevia leaf extract, pepper (coloring). Plain flavor: citric acid, malic acid.